The proliferation of 'gold' radio stations and revisionist rock chronicles have [sic] conspired to turn Procol Harum into one-hit wonders. While the 'oldies' airwaves are filled with A Whiter Shade of Pale , the activities of Procol's contemporaries such as Pink Floyd attract far more media attention. This is no slight on the Floyd, but among the advantages they enjoy is the ability to trade on thirty or so unbroken years as a band. The entry for 'legendary' in the rock thesaurus also lists 'still together'. Woe betide the 1960s or 1970s giant that crashes to earth – in Procol's case, ten years after their dramatic 1967 début – then rumbles back to life in a 'reunion'. So underwhelming was the reception to their polished 1991 album The Prodigal Stranger that it was never released in Britain. When the punk era began, it became obligatory to titter at the musical intricacies of Procol Harum and their ilk, and it may not be a coincidence that that band split up at that time. Not withstanding the millions of albums sold over the previous decade, the group had made no real effort to turn itself into a stadium attraction during the heady days of gatefold sleeves, labyrinthine arrangements, and the unfathomable imagery of Keith Reid's lyrics. Disillusioned by the reaction to their comeback, group leader Gary Brooker has put future recording plans in cold storage while gathering fellow-original Matthew Fisher and a band of sympathetic session players together for an eight date, for-the- hell-of-it tour to preview the release early next month of Homburg and Other Hats – Procol Harum's Best Songs. The revival thus had all the unforced bonhomie of a pub gig. The Empire show was Procol's first London appearance since they taped a Sight And Sound In Concert show for BBC2 in this very location 18 years ago. I recall that on that final tour, a weary band could hardly be heard for the landlord ringing time on its career. Now all, all shackles shaken loose, their playing was both taut and carefree and deserving of a larger audience than a sketchy turnout of mainly young males, vaguely aware that these men first recorded ' that Annie Lennox song'. Brooker, now 50, may have acquired grey locks and a ponytail, but his voice remains a jewel, and Procol's performance of just about every well-remembered song in their catalogue was definitive. 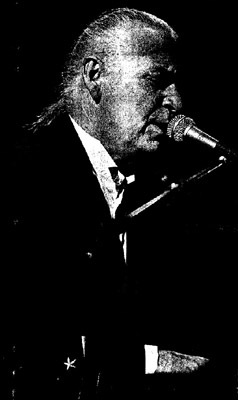 Instant soundbites such as Homburg and Pandora's Box mixed convivially with epic, episodic pieces such as Whaling Stories, Grand Hotel and the still stirring A Salty Dog, while the overlooked mid-Seventies single Nothing But The Truth was one of several convincing rockers underpinned by Fisher on the organ. As that instrument led us into an unfeasibly fresh A Whiter Shade of Pale, one savoured the sight of dinosaurs skipping the light fandango. Sightings continue tomorrow night in Folkestone.